Sustainability occupies an increasingly important role in our lives, both as citizens and professionally. Everyday examples of this are the energy ratings of appliances, buildings, vehicles, etc. 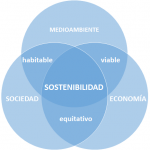 Sustainability is an important partof our daily lives. Recently, El Pais published an article questioning the sustainability (ecology) of e-commerce. There are many examples like this one, both the media and even in our professional environments, sustainability assessments that are at least questionable. The fundamental question is, what criteria apply for the assessment of sustainability? Is an assessment that integrates the different aspects that influence sustainability? Make no mistake, the environmental requirement is an important issue, but not the only one to take into account when talking about sustainability. The World Commission on Environment defined, in 1987, the sustainable development concept to refer to development that ensures the satisfaction of the needs of the present without compromising the ability of future generations to meet their own. Thus, if it comes to assessing the sustainability we were only on environmental or ecological part, we may be seeing only part of the polyhedron and maybe we won’t be able to see the wood by the threes. We have been observing that in recent times that sustainability, as transparency or cytizen participation, are essential questions when making decisions, at local, regional, or national levels. In this regard, it is worth stopping and reflecting, we have tools to perform comprehensive value analysis, which allow grouping the different sensitivities that make sustainability and to enable global visions of the problem? The answer is a resounding yes. Smart Engineering, spin-off of the Universitat Politecnica de Catalunya, has been developing since its creation tools to help on value analysis and sustainability assessment, which enable the analysis above. These tools are based on the MIVES method, a tool developed by professors and researchers from the same university. These tools help on providing answers in many different field of knowledge. Some examples recently developed by Smart Engineering is the assessment of the sustainability of different additives used in the preparation of shotcrete (BASF Construction Chemicals), the development of a sustainability index for the investment of municipal projectsl (City Council of Barcelona), and the sustainability assessment of the system of selective waste collection.